NASA's Mars Exploration Rover Opportunity has given scientists a new view of where the space agency's rover settled for the recent Martian winter. According to NASA's Jet Propulsion Laboratory, the rover's panoramic camera (Pancam) has found fresh rover tracks and an impact crater from billions of years ago. The Pancam has also spotted the reddish terrain around the outcrop where the rover hunkered down. 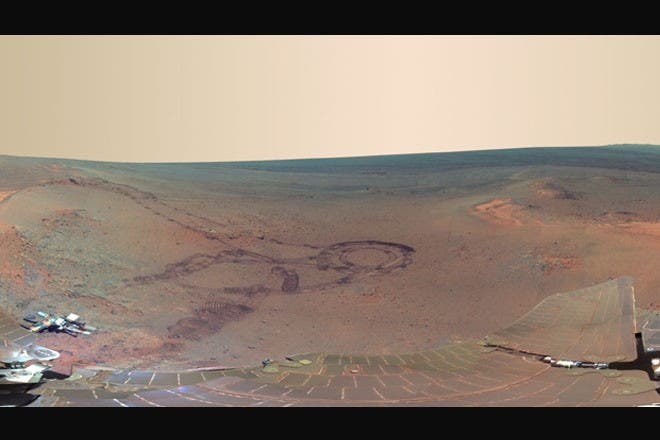 The Jet Propulsion Laboratory compares the panorama from the rover's mass-mounted color camera to the view one would see from the top of the rover, looking out at the Martian landscape. NASA scientists said the release of Pancam footage marks several milestones for the explorer: Opportunity's 3000th Martian day and NASA's 15 years of robotic presence on Mars. "Opportunity has now exceeded 3,000 sols, or Martian days, of operation on the surface of Mars!" reads the latest Opportunity update. "The rover is still exploring the north end of Cape York on the rim of Endeavour Crater." Those interested in the footage can view it here. According to scientists, the footage is "presented in false color to emphasize differences between materials in the scene." The 817 component images were captured between Dec. 21, 2011, and May 8, 2012, while the Mars rover was hunkered down on "Greeley Haven," on a portion of the rim of the Endeavour Crater. "The view provides rich geologic context for the detailed chemical and mineral work that the team did at Greeley Haven over the rover's fifth Martian winter, as well as a spectacularly detailed view of the largest impact crater that we've driven to yet with either rover over the course of the mission," Pancam lead scientist Jim Bell of Arizona State University said in a statement.